Bill Field rode the trail regularly with family and friends. 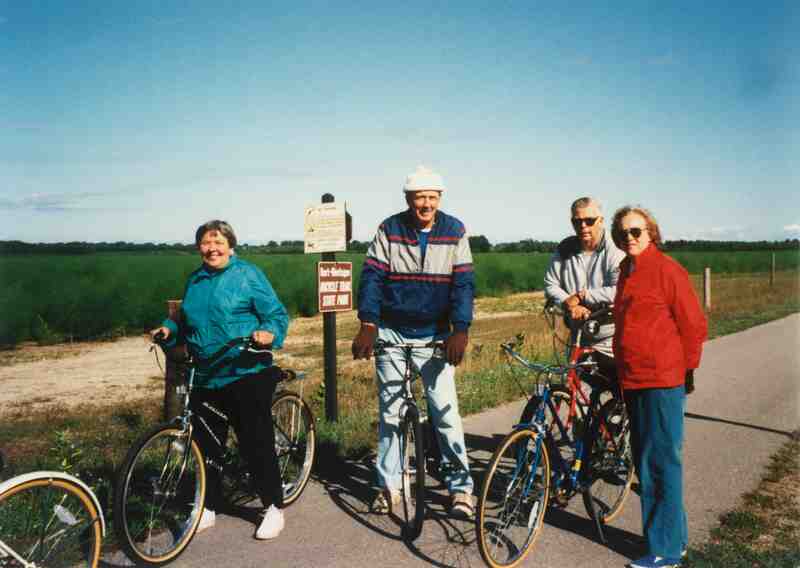 Pictured on an early morning ride to Mears are (left to right) Marlene Schihl, Bill Field, Bob Field (brother) and Bob’ wife Emma. Photo courtesy of Marjorie Peterson. Ross Field is reminded of his father almost every day. His office in the Shelby train station sits next to the William Field Memorial Hart-Montague State Park Trail – the popular 22-mile rail-trail named after his father. Hundreds of cyclists annually ride the old railroad corridor. He may see them when they roll by his office, or when they stop at the Brown Bear, a local eatery known for its burgers. The trail wouldn’t exist if not for the late-Bill Field, who purchased the abandoned Chesapeake & Ohio rail corridor for $175,000 in 1984 so it could be preserved. He then donated it to the state in 1987 so a public recreation trail could be built. Field could have sold the land for a half-million dollars, or more, according to son, Ross. But he chose only to recoup his investment by selling off lease lands along its route. It was an unprecedented move by a native son, a produce harvester from Shelby that many call a visionary, though others once called him a fool. “Very few in politics here in Oceana County wanted to touch that thing,” Ross recalls of the bitter dispute that divided the community and railed on for years about the prospective trail. His father, a county commissioner, had attempted in 1982 to gain approval for its purchase by Oceana County. The county parks and recreation commission supported the idea, but it got only wavering support from the county board of commissioners who eventually rejected the notion as too costly and complicated. Farmers along the trail feared cyclists and other prospective users. They worried about vandalism, crop losses, indecent behavior – and worse. Other private individuals along the trail also hoped to buy a piece for themselves. Cyclists enjoy the William Field Memorial Hart Montague Trail. Photo courtesy of Michigan Trails Magazine. Bill Field, however, was not to be deterred. While laughed at by peers, even as the chairman of the county board of commissioners, his vision, tenacity and legacy are lauded today. 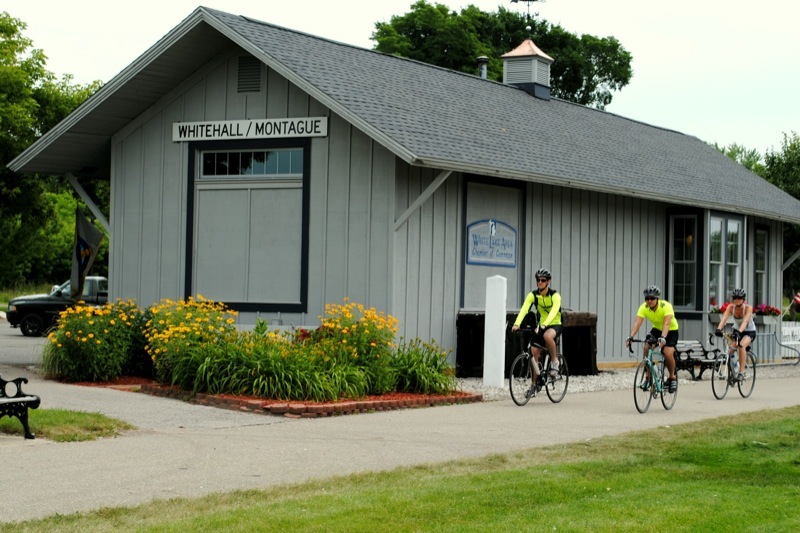 The Hart-Montague Trail, as many commonly called it, became the first paved rail-trail in Michigan. It was dedicated in 1989 and drew 59,000 visitors in 1992, according to Michigan state park officials. That influx of tourists to once-sleepy communities along its route inspired a new generation of trail-side businesses, from bike rentals to restaurants. William “Bill” Field was born in Shelby in 1927, son of a crop sprayer and one of seven children. He grew up in a farm family and developed a strong work ethic as a young boy. His younger sister, Marge Peterson, now 85-years-old and living in Hart, remembers how he rode the local milk truck each morning, delivering milk to homes as a 12-year-old boy, before going to school. Young Field also worked at the local meat market to earn extra money. As a boy growing up in a rural community, Field was like a lot of other boys. He played sports and spent time with friends. His 1946 Shelby High School year book, Tiger’s Tale, characterizes him as “care free.” He would wander down to the railroad tracks and watch the trains – and try to coax a ride. Bill Field’s son, Ross Field, and sister, Marjorie Peterson at the staging area in downtown Shelby. Photo courtesy of Michigan Trails Magazine. Field’s love for the rail corridor developed at an early age and never abated. An ardent history buff and member of the Oceana County Historical Society, Field appreciated the railroad’s role in opening the region to commerce. The rail line stretched from the city of Hart south to Montague. It was abandoned in 1972 after fostering 100 years of regional economic development. Field dedicated the trail to the pioneers that built the tracks. He also celebrated their accomplishment by riding the trail regularly with two older friends who would meet and bicycle north to Mears for breakfast and enjoy a leisurely ride home. “Dad was a real innovator and an early adopter of innovations,” Ross shares. “My brother Bob and I grew up on the farm. He had some of the first mechanical harvesters around here. We had the cherry harvest business and shook orchards in the Jackson area, and up on the Old Mission Peninsula. A world traveler who visited Europe, Israel and Egypt, Field also toured the U.S. with his family. He was a voracious reader, a man who loved to sit on the beach and settle into a book. He and his sisters spent many summer days relaxing along the shore at Pentwater. Bill Field was known to be determined. When he couldn’t work out a satisfactory agreement with C&O real estate managers to buy the trail, he called the railroad chairman directly. His offer was accepted. He put $2,000 down and bought the 22-mile rail corridor on a land contract. “He didn’t let anything stand in his way,” recalls Joel Mikkelsen, former chairman of the Oceana Parks and Recreation Commission during those critical years. He remains on the commission today. “Bill took the (Board of Commissioners) rejection hard, but he recognized that if you own the land, you have a lot to say about issues. So, he bought it – and people really started to listen. It wasn’t going to be ‘Field’s Folly,’ (as some chided). Mikkelsen, Field, and Barney Steen, another local advocate, approached the Michigan Department of Natural Resources in 1986 with an offer to donate the trail to the state. They met with Jack Butterfield, then chief of Michigan State Parks. The men promised the trail would be developed as much as possible first, using a $506,000 grant from the Kammer Recreational Land Trust Fund grant (later renamed Michigan Natural Resources Trust Fund) that was awarded to Oceana County Parks initially. The grant was later transferred to the city of Hart because the Oceana County Board of Commissioners decided to reject it. Floyd “Jake” Whelpley is glad the old rail corridor has become a state park. He owns The Wood Shed Bike Shop, just south of Mears along the trail, where he’s rented and repaired bicycles for 24 years. The business grew because of the trail. Over the years, he also got to know Bill Field. “Everyone (at first) thought he was an idiot and didn’t know what he was talking about,” Whelpley said about Field’s early efforts to secure the trail. “But, he took the bull by the horns. It was an extremely tough fight. Bill loved Oceana County; it was his heart and soul. He was as tenacious as they come. Ross Field often hears similar comments from others. Tall like his dad, he bears a strong resemblance. Being a real estate appraiser, he encounters many in the course of his work who knew his father. 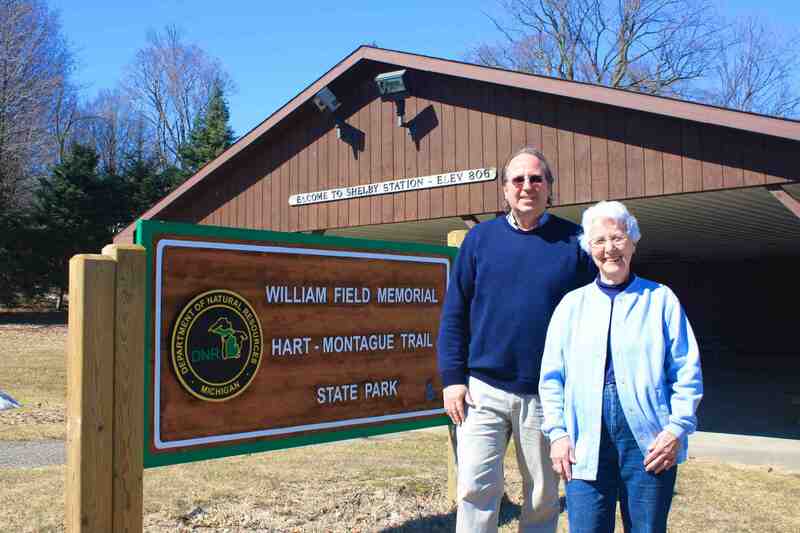 The 22-mile Hart-Montague Linear State Park Trail was renamed the William Field Memorial Hart-Montague State Park Trail in 2013, and dedicated in William Field’s honor. To download a free map of the trail see: William Field Memorial Hart-Montague Trail. This story appears in Michigan Trails Magazine. This entry was posted in Uncategorized and tagged Adventure Travel, Bill Field, Cycling, Hart, Michigan Department of Natural Resources, Montague, Shelby, Shelby Library, Trails, William Field Memorial Hart-Montague State Park Trail. Bookmark the permalink.